The Cupola is an ESA-built observatory module of the International Space Station (ISS). Its name derives from the Italian word cupola, which means "dome". Its seven windows are used to conduct experiments, dockings and observations of Earth. It was launched aboard Space Shuttle mission STS-130 on 8 February 2010 and attached to the Tranquility (Node 3) module. With the Cupola attached, ISS assembly reached 85 percent completion. The Cupola's 80 cm (31 in) window is the largest ever used in space. The Cupola provides an observation and work area for the ISS crew giving visibility to support the control of the space station remote manipulator system and general external viewing of Earth, celestial objects and visiting vehicles. Its name derives from Italian word cupola, which means "dome". The Cupola project was started by NASA and Boeing, but canceled due to budget cuts. A barter agreement between NASA and the ESA resulted in the Cupola's development being resumed in 1998 by ESA. 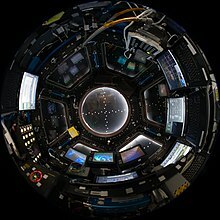 The existence of the Cupola is considered important to astronauts aboard the ISS, as previously they have been confined to looking out of small portholes or at best the 20-inch (50 cm) window in the US Destiny laboratory. The Cupola is berthed onto the Earth-facing port of the Tranquility module. Because of its shape and multi window configuration the Cupola has been compared to the cockpit window of the Millennium Falcon. 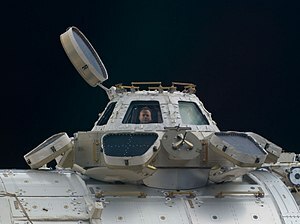 The International Space Station Cupola was first conceived in 1987 by Space Station Man-Systems Architectural Control Manager Gary Kitmacher as a workstation for operating the station's Canadarm2 robotic arm, maneuvering vehicles outside the station, and observing and supporting spacewalks. He likened the use as similar to that of the Shuttle Orbiter Aft Flight Deck. There were to have been two Cupolas, one on either end of the racetrack shape formed by the station modules and nodes. 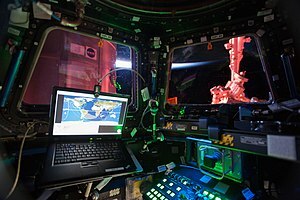 It was initially named the "windowed workstation", to distinguish it from other computer-based workstations inside of the station and from which the crew could operate the station's systems. Once the idea was initially accepted, a number of people went to work. Human factors specialist Frances Mount began to develop the rationale and operational scenarios for the Cupola, and got considerable support from Chief Astronaut John Young and Shuttle Commander Gordon Fullerton. Charles Wheelwright, who had defined the specifications for every window on every prior United States manned spacecraft, began to define the design specifications of the Cupola windows. Laurie Weaver, who had just started with NASA as a student intern, began to work on a series of different configurations for the Cupola. She started with Kitmacher's idea, based on the Shuttle Aft Flight Deck, in this case two Aft Flight Decks mounted back to back, placed atop a short cylinder. An inexpensive mock-up made of PVC tubes was built and tested underwater, where critical dimensions could be measured to ensure that two crew members in zero-g would have adequate access. Then she built a series of small cardboard models, looking at a variety of different alternative shapes. The different configurations and their positive and negative attributes were presented at a series of Crew Station Reviews over the next year in which participants rated each. The Cupola that evolved was octagonal in shape, with eight similar windows around the periphery, four quadrant windows overhead, and mounted on a cylinder. The module was designed to fully contain at least two crewmembers "floating" side by side in zero-g neutral body posture. About this time, Kitmacher and designer Jay Cory applied the term Cupola for the first time. Kitmacher wrote the requirements and the name into the Man-Systems Architectural Control Document and into the requests for proposals for Work Package 1 at MSFC and Work Package 2 at JSC. Later, Kitmacher went on to lead the Man-Systems group, leading the first lunar outpost and moonbase studies and the Cupola reappeared on several of his rover and module designs. Because of confusion between the responsibilities of the two contracts, both Boeing, which won Work Package 1, and McDonnell Douglas, which won Work Package 2, bid to build the Cupola. The McDonnell Douglas design was basically the same as NASA's, but Boeing's was smaller — a hexagon, with a single large circular overhead window, and a much shorter cylinder. The Boeing design had been considered but previously discarded, because it was unable to accommodate two crew members completely, and would instead require the crew to dangle their legs and bodies in the Node to which the Cupola would be attached. This design was the one ultimately built. Components of the Cupola were initially fabricated in California, and the windows in New York in the late 1980s, but as budgets were cut, the Cupola was a favorite target. Several times it was fought back into the program only to be cut again as not technically required. More than once the responsibilities for fabrication were bartered to one international partner and then another in exchange for Shuttle launch services and resources that the United States would provide on board the station in orbit. The Cupola made the rounds to Brazil and then finally wound up with ESA and the Italians in 1998, who completed it in 2003. Even then, the launch of the Cupola was repeatedly delayed until it finally made it into orbit in February, 2010. The delivery method also changed from the Cupola being mounted on a SpaceLab pallet accompanying Kibo's external facility to being mounted on the European built Tranquility module as it was delivered. The original barter agreement had ESA building two cupola modules for the ISS. This was later amended to just one. The ESA-built Tranquility module and the cupola together cost nearly $409 m.
With final design and assembly by the Italian contractor Alenia Spazio (now Thales Alenia Space), it is nearly 3 metres in diameter and 1.5 metres tall. It has six side windows and a top window, all of which are equipped with shutters to protect them from damage by micrometeoroids and orbital debris. It features a thermal control system, audio, video and MIL-STD-1553 bus interfaces, as well as the connections needed for installing one of the two identical robotic workstations that control the Canadarm2 into it. The Cupola's outer framework is made from forged aluminum, with an inner skeleton made from steel plates and bars welded together; which add strength against the pressure. Several companies including Alcoa and Tata Steel Europe were contracted for the manufacturing. Each window is composed of 4 separate layers ('panes'): An outer debris pane, two 25 mm pressure panes, and an inner scratch pane. Each pane is made from high strength bulletproof glass, to protect against micrometeorites. The whole glass assembly measures 70 cm thick. The panes can be replaced in-orbit after an external pressure cover has been fitted. The window shutters are manually controlled. Each window has a knob with a direct mechanical linkage to the outside shutter assembly. O-rings are used to prevent air leakage. Cupola was launched aboard the Space Shuttle on mission STS-130, on February 8, 2010. It was berthed to the forward port of the Tranquility module for launch, and was later transferred to the nadir-facing port of Tranquility by the Canadarm2, once Tranquility had been berthed to the Unity Module of the ISS. The installation of the Cupola, along with Tranquility, marks one of the last main components to be added to the International Space Station. ^ "Thales Alenia Space and ISS modules - Cupola: a window over the Earth". web.archive.org. 26 July 2010. ^ esa. "Largest window for space completed". European Space Agency. ^ "First Photos: Space Station's Observation Deck Unveiled". NationalGeographic.com. 18 February 2010. Retrieved 26 November 2014. ^ artist, Kitmacher, Cicorra (18 April 1990). "English: Heavy, pressurized lunar rover intended to enable up to four crew to rove for two weeks on the Moon's surface. A crew airlock permits crew to exit and enter the rover and may double as a docking adapter to the Moon base. A smaller sample lock permits retrieval of lunar samples using remote manipulators mounted on the rover front. A cupola on top, similar to the cupola on the International Space Station, is a secondary driving station and permits views of the lunar terrain 360 degrees around the horizon and to much greater distances than the lower driving station" – via Wikimedia Commons. ^ esa. "ESA's International Space Station barter agreements". European Space Agency. ^ "Endeavour Delivers Tranquility and Cupola to International Space Station". SpaceNews.com. 15 February 2010. ^ NASA. Inside the International Space Station, a Comprehensive Review of ISS systems. NASA. ISBN 978-1521241912. ^ SmarterEveryDay (8 May 2015). "7 HOLES in the Space Station - Smarter Every Day 135" – via YouTube. ^ esa. "Cupola". European Space Agency. Wikimedia Commons has media related to Cupola module. This page was last edited on 18 April 2019, at 16:51 (UTC).